Do you live like an outlaw? Do you play by your own rules? Han Solo does. He doesn't let anyone tell him what to do! Not a whiny farm boy from a backwaters planet. Not a Princess from Alderaan. Not even a Jedi Master. He also never lets his enemies get the upper hand and he's certainly not afraid to use his blaster on any bounty hunter who tries to collect the bounty on his head. Just ask Greedo about that! 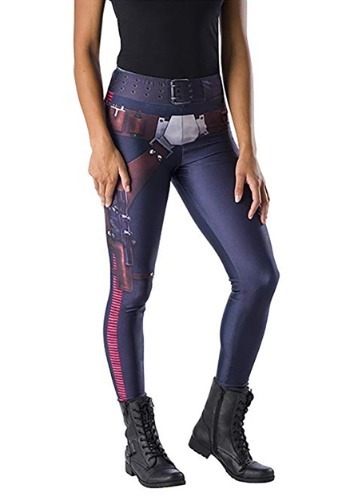 Maybe your life isn't filled with quite as much danger as Han Solo's, but you can still add a bit of his rebel style to your look when you wear these women's Star Wars leggings. These Han Solo leggings are officially licensed from Star Wars. They're made of a polyester and spandex blend that stretches to fit. They also feature an elastic waistband, which help to facilitate a form-fitting style. The printed graphics on the exterior recreate the look of Han's pants from Star Wars: A New Hope. If you're ready to live the life of an outlaw-smuggler, then slip into these Star Wars leggings! Of course, if you want to create a quick and easy cosplay outfit, then all you need is your favorite white shirt and a black vest to complete the classic Star Wars look.